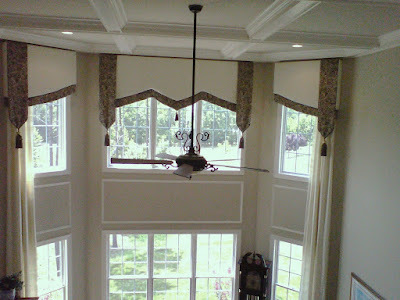 We created these hard wood cornices and covered them in a cream colored Dupioni Silk. At the bottom we added a much heavier tapestry to add visual balance. Then we mounted them 19feet up. 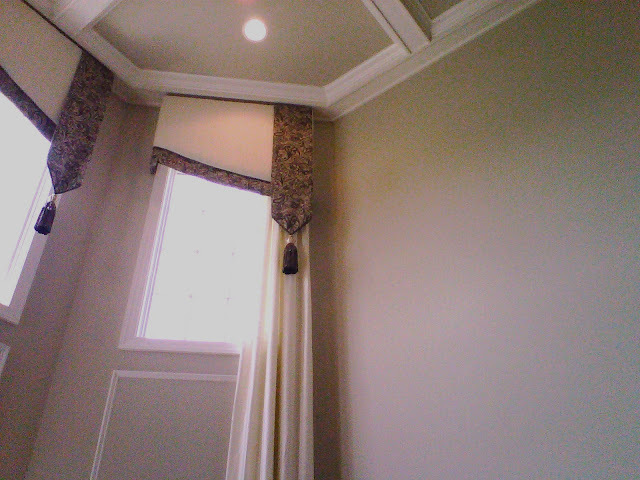 The long point on the cornice is 42". The short point 26" and the tails measure 52"
Okay, here's a tip as to how we managed to hang these without scaffolding. We cut wholes under the flagged pieces at the top of the large cornice, used two 20 foot extension ladders, grabbed that baby and carried it up. After placing it on angle irons that we put up earlier we reached through the whole and tightened the screws. When the room is this large and the ceiling height measures 20 feet you need large statement pieces. In order to keep the statement pieces from being so bold as to seem as though they pop off the wall you can tone down the effect by using a soft neutral colored fabric. Then add a little bit of detail with an accent fabric. Here are the fabrics we used. Please give us a call if you are interested in seeing more. they're big fans of magenta – at least compared to the rest of the population. You'll find the link to read this article and take the test below. I snapped these photos in the home of one of my favorite clients. She's bold, compassionate and confident. She is also a very successful business woman. I value her critique as well has her encouragement. That's me putting the final touches on the window treatment. Check out this sofa and the feathered pillows. You can click each picture to enlarge. Follow this link to read the article and take the test.